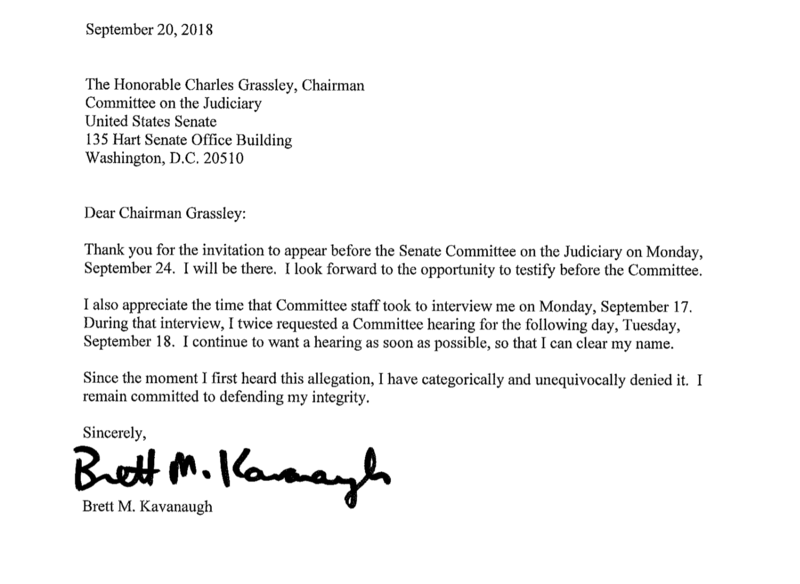 Supreme Court nominee Brett Kavanaugh wrote a letter to Senate Judiciary Committee chairman Chuck Grassley Thursday expressing his desire for a prompt hearing respecting allegations of sexual assault brought against him by Dr. Christine Blasey Ford. Kavanaugh, who has not spoken at length about the allegations other than to vigorously deny them, expressed his eagerness to appear before the committee, while his accuser’s lawyers are still negotiating the terms under which their client would give testimony. It’s not yet clear whether or when a hearing will take place. Though committee Republicans appear prepared to take up the allegations Monday, Blasey Ford’s lawyers sent an email to the committee Thursday indicating that the hearing should not take place as scheduled. Blasey Ford’s attorneys reiterated their preference is for federal investigators to pursue the matter before the Senate hears testimony. Committee Republicans are said to be hiring outside counsel to lead the hearing. Kavanaugh has retained attorney Beth Wilkinson to represent him, an Army veteran turned federal prosecutor who founded a boutique practice specializing in “winning high-stakes trials,” according to its website. Since Blasey Ford’s allegations appeared Sunday in The Washington Post, a deluge of violent rhetoric has descended on both parties. The Ford family has left their California home for an undisclosed location in view of continued concerns about their safety, while Mrs. Ashley Kavanaugh received death threats at her work email address.